This individual deal report shows that there is a spike in lease risk in 2017, and then there is ongoing moderate risk due to tenant default and finally a large refinancing risk. If this deal was under consideration for credit approval, the risk may be mitigated by for example changing the amortization rate. If the asset was already in the portfolio there are fewer options for changing the loan terms but it may still be possible to add a swap for example to reduce the risk of a poor exit yield if interest rates rise. If there is no obvious way to change the structure, the strategy may be simply to start negotiations with the client long before the refinancing crunch. Lease risk: at origination one option would be to ensure that a reserve will be built-up to help cover the debt payments when the lease payments become uncertain. Another option would be to accelerate amortization in the period when the lease payments are more certain, and plan an amortization reduction for a period after the lease terms change. If the loan is already on the books there is less freedom to change the terms, but the information could be used to increase the monitoring of covenants, and change the terms to the extent allowed by the loan documentation. This is potentially a win-win situation for the bank and the customer if a costly default and foreclosure can be avoided through early planning. Interest rate risk: if interest rate risk is significant, it may be mitigated by some degree of hedging. This may be a fixed-floating swap for some portion of the loan, or a cap. In general one would want the interest rate characteristics of the net income to reasonably match the interest rate payments on the loan. Long-term fixed rate leases should be matched with fixed or capped interest payments. Short term or market resetting leases can have a partially floating rate loan. Refinancing risk: there are three main sources of refinancing risk, poor LTV due a fall in market value, poor net income, or increased interest rates. If needed, the risks of poor LTV and NOI can be modified in the usual way with amortization, reserve accounts and sinking funds. The risk of net income not covering interest payments can be mitigated by having interest rates swaps or caps extending beyond the current maturity of the loan. With advanced risk models, the deal can then be re-run with the hedge to show the extent of mitigation. 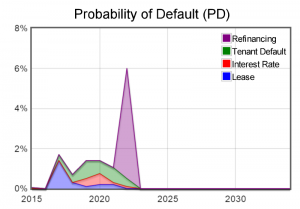 Tenant default risk: at origination the risk of a tenant defaulting can be treated by increasing initial amortization, building a reserve account, or simply increasing the loan price to compensate for the increased risk. At an extreme, the new deal could be avoided, especially if the tenant shows up on the portfolio tenant report for other assets. Let us now look at the results of the portfolio analysis. An example portfolio report can be downloaded with this article below. The main risks in this example portfolio are spikes from refinancing risk and lease expiration risk in 2016 and 2020. As can be seen from page 4 of the report, more than half of this risk is caused by customer 800713. For an existing portfolio there are five sets of actions that can be guided by such a portfolio report. 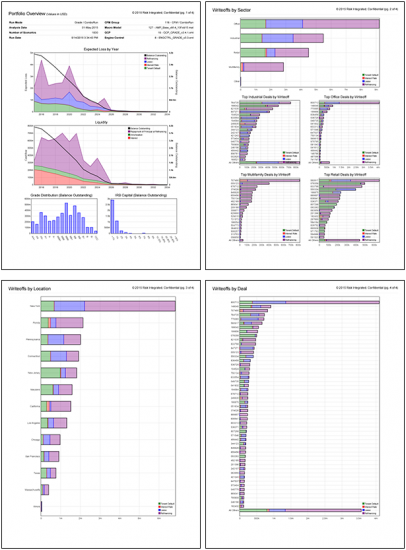 Drill down to the particular assets causing the largest risk, and see if they can be modified as discussed previously. Disseminate a general policy guideline to modify the existing portfolio, e.g., by encouraging customers to have swaps. Identify assets or groups of assets causing risk concentrations and try to sell them. Avoid originating new assets or renewing existing assets that add to the concentrations of concern. This may simply be a temporary credit committee policy to increase the minimum price for originating loans with particular features. Use macro-hedges to offset the cashflows from the portfolio as a whole. For example if defaults are expected to rise with increasing interest rates, buy a swap that makes payments to the portfolio at the time that rates increase. Another possibility for a macro hedge is to use a property derivative to pay into the portfolio at a time when values are falling and refinancing failures are increasing (this may be provided by an investor wanting general exposure to the CRE market without the trouble of owning individual assets). Although macro hedges can help to balance the net portfolio cashflows, it is generally better to concentrate on avoiding the default of the underlying assets, because that avoids the dead-weight-loss of operational and foreclosure costs. Overall, the reports detailing the individual risk components can be used both during the structuring of individual deals as well as for testing the potential effectiveness of alternative risk mitigation strategies by adding the modified structures. Alternatively the base case results can be used to inform, augment and challenge the intuition of credit experts, spurring them to mitigate risks they would not have otherwise considered.